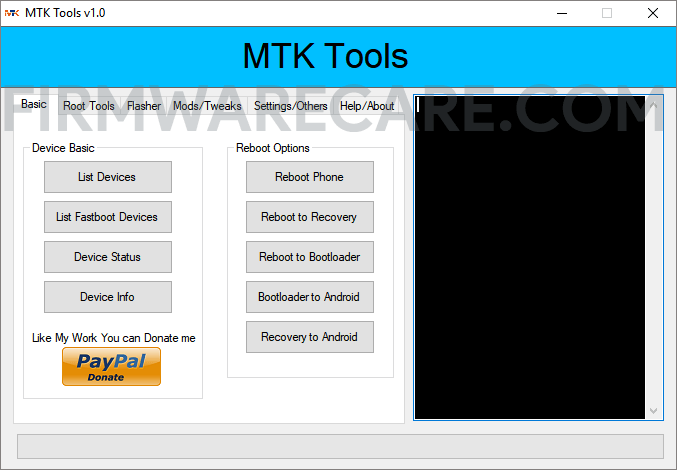 MTK Tools v1.0 is a small application for windows computer created by KP 2017, which allows you to flash the stock firmware, stock recovery, custom recovery on your android device running on mediatek chipset. MTK Tools v1.0 also come with different Root Tools for your device. This tool allows you to perform both basic as well as reboot operations on your android phone running on MTK chipset. The other features of MTK Tools v1.0 includes Reboot Phone, Reboot to Recovery, Reboot to Bootloader, Bootloader to Android and Recovery to Android. Since, MTK Tools v1.0 is an open source tool, You may use it free for always and in case if you really like the developer’s work, You can also donate some money via Paypal. In order to use the MTK Tools, you need to install the Universal ADB Driver on your computer. [*] Compatibility: The MTK Tools Application runs perfectly on Windows XP, Windows Vista, Windows 7, Windows 8, Windows 8.1 and Windows 10 (32 bit and 64 bit). [*] Credits: MTK Tool is created and distributed by KP 2017 (developer). So, full credits goes to KP 2017 (developer) for sharing the tool for free.